Melissa Joan Hart explained it all�from dating to bullies�in her groundbreaking role as Clarissa Darling on Clarissa Explains It All. She cast a spell on millions more viewers as �Sabrina, the Teenage Witch. Now, in Melissa Explains It All, Melissa tells the frank and funny behind-the-scenes stories from her extraordinary past and her refreshingly normal present.Melissa has been entertaining audiences most of her life; when there were no girls named Melissa on her favorite show, the forceful four year old decided she�d get on TV her way. From that moment on, Melissa has shown a singular determination and focus�whether it�s for booking three national commercials so her dad would build her a tree house or for nailing the audition for Clarissa. From her first commercial to her current starring role in ABC Family�s hit Melissa and Joey, Hart never let fame go to her head. She always had one foot in Hollywood and one foot in reality�and still does. Melissa makes us laugh along with her as she talks about:--guest appearances in shows like Saturday Night Live and The Equalizer --auditioning for Punky Brewster and Clarissa--her early Broadway days--wacky parties she�s thrown and attended-- the actors who influenced her and whom she befriended, worked with and competed against --her experiences both on and off-set�with Sabrina�s Salem the Cat and Elvis the Alligator on Clarissa --how she met the love of her life at the Kentucky Derby Melissa Joan Hart explains all that she�s learned along the way�what�s kept her grounded, normal and working when others have not been so fortunate�and that she�s the approachable, hilarious girl-next-door her fans have always thought she�d be. I am a total sucker for audiobooks by celebrities. I think this is because celebrities have interesting voices and you know can act and such as they narrate books. 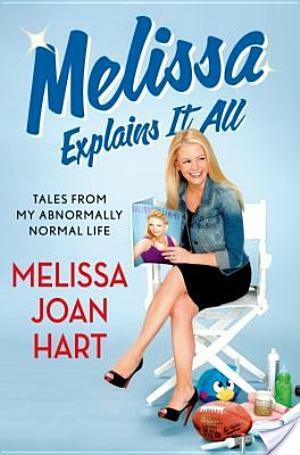 When�Melissa Explains It All: Tales From My Abnormally Normal Life by Melissa Joan Hart showed up in my BUY THIS BOOK recommendations after I added Nick Offerman’s book to my wish list, I thought, ah what the hey this is short and bound to be intriguing, so I threw away a credit on it. Furthermore, I cannot ever resist nostalgia. Unfortunately, this audiobook made me dislike Hart just a little bit. It’s hard for me to put a finger on why. Probably because the book does hold back a bit and she comes off as arrogant and conceited. Like, I get that she works really hard as an actress, but don’t diss on my girl Drew Barrymore and expect accolades. A lot of the book kind of feels like she’s expecting praise for being so normal and not the typical burned out child actor. But, eh. I don’t know. I just have this aversion feeling that I did not have before. Melissa Explains It All�opens with Melissa describing her parents background, how they were pretty much poor but hardworking. Then she gets into her first acting gigs and talks about commercials. She describes growing up and seeing acting as a hobby. She and her various siblings were schlepped around from audition to audition. Eventually she lands the lead role on Clarissa Explains It All. She also gets into talking about her experience on Broadway, living on her own in Florida with a guardian who basically were stand ins for her parents. Then she gets into Hart Break Productions and talks about Sabrina. OH and trips she takes all over the world and being famous and going out clubbing and being drunk. She gets into getting married, motherhood, and becoming a Crimson Tide fan (FYI, when I first read about that in another review, I thought it was a reference to periods because I am clearly insane). Oh and birthday parties today and how if you are rich, they are elaborate affairs. That she took Britney Spears to her very first club and snuck her in the back door. She was high on ecstasy for the infamous Maxim shoot. She has a room in her house dedicated to the Crimson Tide. She grew up on Long Island. Just before Farrah Fawcett died, she made this tasteless joke about her hanging on long enough for MJH to get the cover of People. She didn’t seem apologetic about it in the book. This fuels my disdain a bit. She wears the same outfit throughout the audition process so casting directors remember her. She saw Calista Flockhart as a role model and mentor when they worked together on Broadway. She owns a lucky dress. Her parents basically did not supervise her or parent her during her teenage years filming Clarissa. This makes me sad for some reason. She’s got a lot of siblings. She goes to the gym a lot. She has a Celtic cross tattoo. Apparently I paid pretty good attention to�Melissa Explains It All. If anything, the narration is the thing that does recommend this book. Melissa Joan Hart does a competent job narrating her life story. She talks a bit fast, but I am from New York, so I had no problem understanding what she was saying. I would imagine you know what she sounds like, so if you don’t like her voice don’t listen. The production values are high quality. The audiobook is never dull or slow and is an appealing listen as you drive to work. It’s easily finished in a couple of days. Diehard Melissa Joan Hart fans and those who want a tame celebrity memoir. I absolutely LOVED this audiobook. I loved Melissa’s stories, her honesty and the fact that she was the one reading the book. Her delivery is GREAT. I was never a superfan. I worked on a few episodes of ‘Sabrina’ in the late 90s, so- I was just curious. I think anyone can enjoy this book. She has some great stories and a great life & family. I was SO SAD when I got to the last CD.. I didn’t want it to end!!! I do have a question- on the back of the CD case, it says “fiction”??? why? ?